Two doors north of El Llano, just north of Lunt on Clark, there is a new spot called Tamales Los Mejores de Guerrero. Actually, this is owned and run by Senora Bustamante, who used to sell her tamales on Sunday mornings in front of the MacDonald's at Clark and Pratt. Now they are available six days a week (they are closed Mondays). This is very convenient for me, as I used regularly to make the trip on Sunday mornings, hoping that she would be there and not have run out. Her tamales are particularly plump, and include both green and red with chicken or pork. The portions of meat are generous, as is the sauce, which is tolerably spicy; this is not for the heat averse! Equally hot are the tamales of rajas con queso, strips of poblano pepper with cheese. 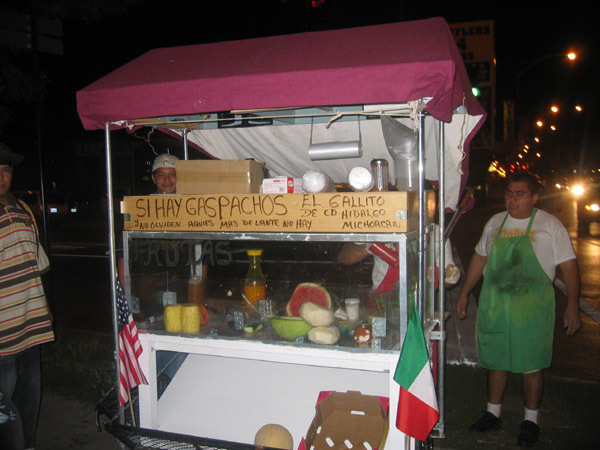 I have not tried frijoles with cheese or picadillo (ground beef), varieties which she did not sell from her cart. There are also sweet tamales -- choice of pineapple or strawberry. There is pozole and menudo on weekends, and mole (I presume a red mole, since this is typical of Guerrero) on Sundays. We are anxious to try the mole, but for the moment I have only gone for takeout. The tamales are $1 or 6 for $5. This is a welcome addition to the already extensive Clark Street assortment. Last edited by chapulin on August 7th, 2006, 10:49 pm, edited 1 time in total. I saw the place a couple of weeks ago with a paper sign that said Tamales Los Mejores de Guerrero. I didn't know if that was the name or just what they sold (or both). I thought a tamale restaurant might be too limited, but now that I know it is the woman from the stand at Pratt, I am excited. Athough, there is a certain satisfaction in buying tamales from an "illegal" street vendor . I wonder if she makes Tamales Nejos on the weekends (which are served with Mole)? Thanks for checking this out. I will sample Señora Bustamante's wares for lunch tommorow. No tamales nejos as far as I know, but perhaps you can persuade her to make some. There is still a stand selling tamales at the corner of Clark and Pratt in the mornings. It looks to be the same set-up and people as always. I haven't confirmed this, but it's possible they have the store and the stand now. Either way, I'm happy to be able to get a tamale fix pretty much any time of day now! The stand selling tamales is not the same as always, when folks have referred to that location in the past (and I have done so on numerous occasions) they are referring to senora bustamente, whose tamales are indeed great things (my favorite being the rajas). I do hope folks will support her new venture - I would hate her to join the list of struggling and/or failed worthy enterprises on that stretch of clark. Last edited by zim on August 8th, 2006, 12:32 pm, edited 1 time in total. I'm pretty sure Pollo Frito is closed. I'd be game for an RP-thon. I was kind of thinking the same thing. Count me in as well. I am always passing these places to and from work, never having the opportunity to stop in for bites. I frequently pass the Lunt & Clark intersection. Some mornings there's a woman on the NE corner who sells tamales and atole from a portable table/stand. I'm not a "tamale in the morning" type of person (opting instead for pan dulce from Ayutla Bakery on Clark St. nearby), but I will try to stop by the place soon, maybe this coming weekend (the storefront) and give 'em a try. Are the tamale's at the Guerrero shop wrapped in corn wrappers, or banana leaves? I prefer the flavor of tacos from Oaxaca and Chiapas, though - the ones wrapped in banana leaves. I did some training work in Mexico City for General Motors in the early-mid 1990's and across from it's assembly plant in the early a.m. were people selling tamale sandwiches - a fat tamale wrapped in a large bread roll. Assembly-line workers seemed to eat a coupe each. One would have lasted me a couple of days! Bill wrote: . . . across from it's assembly plant in the early a.m. were people selling tamale sandwiches - a fat tamale wrapped in a large bread roll. Wow, a Mexican Mother in Law! Bill wrote: Are the tamale's at the Guerrero shop wrapped in corn wrappers, or banana leaves? I prefer the flavor of tacos from Oaxaca and Chiapas, though - the ones wrapped in banana leaves. The Tamales Nejos I mentioned above are Guerreran tamales of masa made with ash and steamed in banana leaves. They have no filling, but are used to scoop up mole. They sell them up the street at Cueztala Gro. on weekends. Thanks to this board, I discovered Tamales Los Mejores de Guerrero. I popped in today and went a little crazy and bought too many delicious tamales. So, can anyone here recommend a good way to store them and freeze them for later? I don't get up that far north too often, so I stockpiled some tamales. I haven't had a chance to stop in this place to sample the tamale's, yet - but I was passing by an hour ago, and snapped several photos - to give people a frame of reference, and a look at the menu/pricing. Unless the place is very busy on the weekend, or it has a good catering business on the side - I'd check it out soon, because my sense is that it may not be around very long. Given the rent and the staff cost, not to mention product,nor the size of the place - this might be a bottomless pit as far as money goes (costs to operate as compared to incoming revenue). It's ironic how the tamale lady at the McDonald's on Clark now has a brick and mortar location. The other night when I went to pick up watermelons from CrazyC, my instructions were: "Go south on Clark, then turn left at the McDonald's where the Tamale Lady works or Pratt Avenue." Driving directions via the Tamale Lady! After collecting the watermelons, Josephine and I stopped by the old Salamera location hoping against hope the fruit vendor or remnnants of may still be there. No luck, though we were told to go two blocks north to Clark and Pratt (you know, where the tamale lady works). 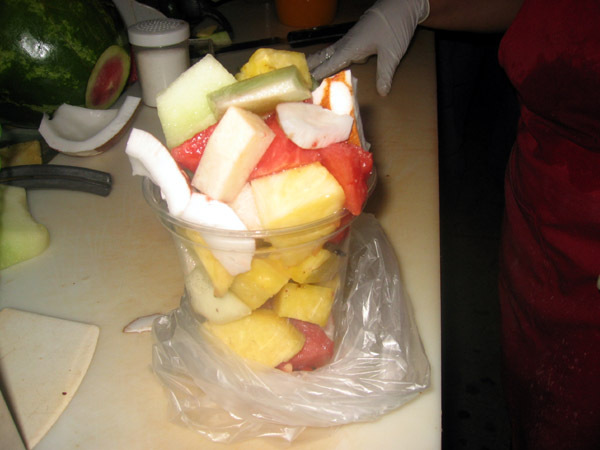 Charmed by the concept, we ordered a $5 cup of mixed fruits (Jicama, fresh coconut, watermelon, pineapple and honeydew) with lime juice, salt and a smidge of chili. While some fruit could have been sweeter, we enjoyed the fruit as a nice, light treat. Made a stop on Saturday while on my way from here to there and grabbed a dozen mixed and sat and ate a few. The place was quiet, very clean and neat and the employees friendly and attentive. Most of the samplings were on the spicy side, the ones with the green (hot) sauce could have used more sauce and the red (mild) ones had plenty of sauce making both of them about the same heat. I will agree that the poblano pepper with cheese tamales had a special fire all their own. Be sure to chew thoroughly before swallowing. They were all very plump, could of used a touch more meat, and the dozen costs us $10. Thanks! Since my favorite La Guadalupana, 3215 W 26th St, Chicago is no longer open. What excellent tamales are to be had here! Yes, absolutely, 12 for $10 and well worth every penny. I especially appreciated the clear clean taste, every flavor distinct, with an elemental earthiness that bespoke of generations of Mexican grandmothers passing tradition ...........Whoa, wait a minute, I seem to be channeling RST, another sentence or two and I might start weeping. Suffice to say the tamales are delicious, hand made, as Hammond said, by camera shy grannies in the back of the shop. I truly hope Bill's gloom and doom predictions for Tamales los mejores de Guerrero are wrong. Thanks for the heads up on the tamales Chapulin. Viva Sra. Bustamante! I love it. Props to Zim for noting this stuff years ago, on that other site; she's been my tamal source since. And to Chapulin for advising us about the new place and the connection. Now everyone can enjoy them much more easily. Sometimes it takes a while for these things to develop, and some good photographic evidence. Soon it'll be in the food rags. I hope so. Panther in the Den wrote: Thanks! Since my favorite La Guadalupana, 3215 W 26th St, Chicago is no longer open. I just joined the forum so that I could help a fellow tamale lover. As of about a month ago, you could still buy their tamales at their shop on Archer Ave., just east of the underpass near 47th St., on the southwest corner. I think the address is 46-something S. Archer. It's a nondescript building and you have to ring the buzzer to get in. And they quit fairly early, like 3-4pm. But they've got all the usual flavors available for $8.50/dozen. Can't beat that with a stick, eh? Good luck. JeffB wrote: Viva Sra. Bustamante! I love it. Props to Zim for noting this stuff years ago, on that other site; she's been my tamal source since. And to Chapulin for advising us about the new place and the connection. That's right, I forgot, Sra. Bustamante's tamale cart was a Zim RBI*. Both you and he have any number of RBI's that have turned out really swell. For example, Zim's Chicken Boti at Khan and your Katy's Dumpling House. JeffB wrote: PS, look at the volume in that masa. No small trick to get those bubbles in there. The texture of the masa in these tamales was quite unlike what I've found in most others, anywhere. It was very light and airy, and as you say, the volume was much greater than expected. Interesting that blocks from each other are two stores selling very different styles of Guerrero tamales: these massive moist babies and the nejos, the thin almost gelatinous masa plates at Cuetzala. Menu note: Tamales Lo Mejor de Guerrero lists as one ingredient "beans with cheese sweet and worn out meet." Couldn't quite guess at the Spanish equivalent here. Were they trying to suggest a ropa vieja-type preparation? Perhaps, but that doesn't seem quite right. Anyway, this place is a treasure. maybe folks have just caught on to my tastes? Actually, I don't think it is so surprising how many recs are ignored - the nature of the forum places such a high premium on digital snapshots, and I don't post those. I've got a few other RBIs - maybe I should make a list sometime. Would anyone know what hours they keep? 5:00 AM to 8:00 PM (based on their menu, it looks like they're open everyday). This being the weekend of the Fiestas Patrias in Mexico, I stopped by at 7 a.m. to pick-up a dozen tamales to bring into work so that co-workers could experiment with something they're not likely to eat very often. I mixed the order: pork, chicken bean w/cheese, strawberry and pineapple. This was my first sampling of the shop's fare. I didn't sample each variety of tamale; I only ate one of pork, with mole rojo (but I sat with co-workers as they ate their's, and had a close look). My tamale was "okay," and could have used a bit more filling; too much masa, I thought. My co-workers, unfamiliar with tamales, genuinely seemed to love 'em. While the women of the shop put my order together, I walked down the street to Panaderia Ayutla, which I think is the best in that neighborhood (1/2 block S. of Lunt, on the E. side of Clark St.). I picked-up a dozen items to bring into the office, too. Co-workers of mine love the churros. I returned to the tamale shop with the bakery goods, picked up the bag with the tamales (and paid the $10) and walked around the corner onto Lunt and hopped-aboard the 7:27 METRA train to Downtown. Bill wrote: I didn't sample each variety of tamale; I only ate one of pork, with mole rojo (but I sat with co-workers as they ate their's, and had a close look). My tamale was "okay," and could have used a bit more filling; too much masa, I thought. My co-workers, unfamiliar with tamales, genuinely seemed to love 'em. And at 12 for $10 geez, still the best tamale deal around. Based on David Hammond's excellent reader piece, my wife and I inhaled a half dozen tamales at this place ($5). They offer nine variations: chicken with green or red sauce, pork with green or red (preferred the green), ground beef, cheese and jalapenas, cheese and beans, strawberry and pinapple. They were all good, but my favorite was the cheese and jalapena; nice chewy cheese and a good mildly spicy pepper flavor. I don't know enough to tell why these are Guerrero style, but they had just the right balance of chewiness, lightness, moistness and filling to masa ratio for my taste. Hope that helps (or simply provides another perspective)!